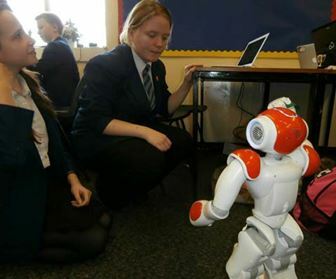 The class were enthused and enthralled by the topic of humanoid robotics; every student was able to produce imaginative, lively writing which was humorous and moving but also thought-provoking and philosophical. We had an short session familiarising ourselves with the Choreographe software. We soon came to terms with it and got beyond the basics, utilising features such as object recognition and face detection. We later learned how to animate NAO to bring him to life. The students couldn’t wait to apply their newly acquired skills to their fantastic creative writing. 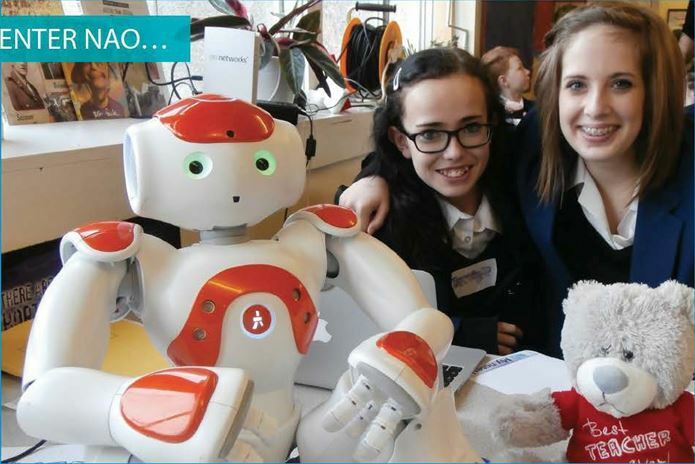 Every Year 8 student absolutely loved working with NAO! Learning how to program each NAO energised, enthused and challenged all of the students in the class. Through trial and error, evaluation and collaboration, each group programmed NAO to speak, gesture, and move to bring great creative writing to life. By the final ‘Showcase’ session, we were able to celebrate the outcomes of hours of hard work and our Headteacher was excited about seeing what students had achieved too. Nerves were tangible: Would our creative writing really come to life? Would the NAO really follow the program that had been written by the students? Whilst Olympic NAO cleverly recognised the gold medal he won in the heady days of his athletic career, Home-Help NAO recounted a day-in-the-life of a humanoid in the home and Police Force NAO explained how his highly developed sensors and bionic strength made the local streets safer. However, Community NAO struggled to recognise the ASDA bag which would trigger his monologue about his community service in helping the elderly carry their heavy shopping home! Despite this, all of the students were proud. They were proud that they had created a great piece of writing together; they were proud that their ideas did actually come to life; they were proud that they had learned new skills and had a unique, inspiring and challenging experience; and they were proud that they had been resilient when they had experienced failures. They had learned so much – and I was proud of them. Students returned to English lessons with a renewed energy; not only were they even more ‘thirsty’ for knowledge, understanding and an opportunity to showcase their literacy skills – relationships had developed too. 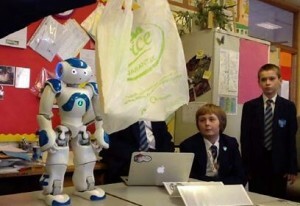 I had enjoyed seeing their range of talents and how they had challenged themselves whilst working with NAO. Their support of each other had grown too; they had further recognised each others’ skills and creative abilities and it was great to be able to build on this in subsequent lessons. For students, writing with a ‘real’ sense of audience and purpose always leads to powerful creative writing. 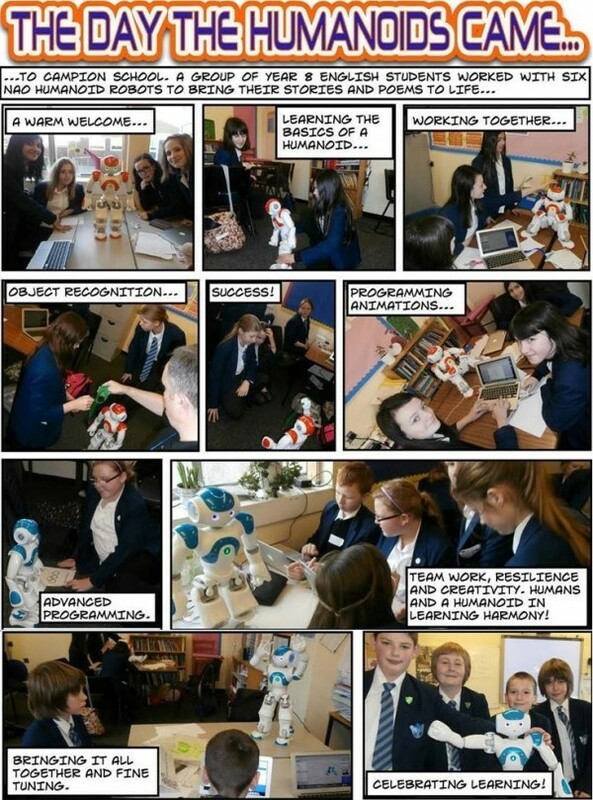 Therefore, when I asked students to write a magazine article for the school magazine based on their experience of working with NAO – the quality of their writing was excellent. Within just 50 minutes, students had crafted a well-structured, lively and technically secure response. Undoubtedly, the richness and variety NAO had added to the English curriculum had fired up a renewed pleasure in writing; students used a broad range of conventions, they wrote with greater accuracy and were keen to redraft, redraft and redraft again… they wanted their writing to be perfect!